When is it safe for your young athlete to begin weight lifting? If your children are playing football, then you may already know that strength not only helps them perform better as an athlete, but it can also help prevent injuries. As your child becomes more involved with football, the more important weightlifting will become. Getting stronger and quicker is something that benefits an athlete in any sport, and this is especially true for football players. 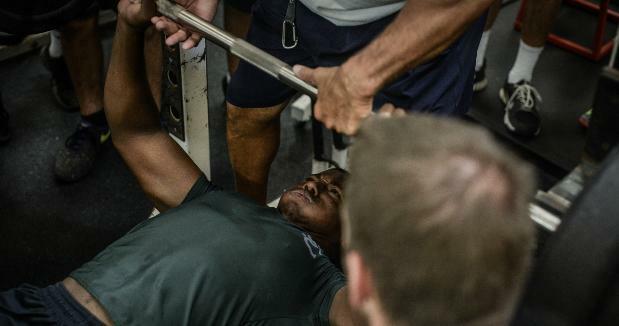 Time in the weight room is not usually an option if a player wishes to excel at the upper levels of football. Studies also show that it can help in injury prevention. Researchers at the University of Florida concluded after studying football injuries at more than a dozen high schools that coaches who want to keep players in the game should keep their players in the weight room. First of all, it’s important to distinguish between weightlifting and strength training. Weightlifting emphasizes heavy weights and maximizing lifts to build strength. Strength training uses low resistance and repetition to build strength and conditioning. Kids as young as 7 or 8 years old can participate in strength training activities if they want. Exercises should be fun and include activities for the total body, using only body weight as resistance. Some examples are jumping jacks, pull-ups, push-ups, sit-ups, squats and lunges. Encourage simple games that involve running, with starts, stops, relays, jumping, skipping and throwing. By age 9 or 10, most children are physically ready to begin training with light external resistance. Keep the exercises simple and monitor how the child tolerates the stresses of training. Use resistance bands or very light weights. Many coaches and physical trainers suggest that kids should not begin any type of weight training before puberty. It would put too much strain on young muscles, tendons and growth plates. By 13, your child’s nervous system and muscles should be developed enough to start getting into the weight room. At age 14 or 15, add sport specific exercises and increase the volume of training. By age 16, most athletes are ready for entry-level adult programs, but only if they have gained a basic level of training experience. Start with higher volume and lower intensity work then gradually build to lower volume and higher intensity work. No matter what age your child starts weight lifting, his or her first year should be spent learning correct exercise technique and developing a general fitness base. It’s always a good idea to get advice for any regimen from a coach or trainer who can guide your young athlete into a safe and age-appropriate workout. Janis B. Meredith, sports mom and coach&apos;s wife, writes a sports parenting blog called JBM Thinks. She authored the Sports Parenting Survival Guide Series and has a podcasting series for sports parents. You can also find her on Facebook and Twitter.